If you are a fan of how little room the Flashback takes up on your board, then you will fall in love with this pedal. Although this pedal seems simple on the outside, you will be delighted to learn that it is just as versatile as its bigger brother, the Flashback. If you are comfortable with TC’s external control technology, TonePrint, the this pedal can take you anywhere you want to go. Do not let this simple face fool you. That mask is covering a wonderful piece of technology. With TonePrint, you can not only access a looper and 10 delay types, but you can add a multitude of effects, reassign any knob to any parameter, and load presets. Although this is a super versatile little box, its full capabilities are only opened up to you with TonePrint. If you do not use that technology, then this pedal would have a versatility score of 1. Very good sound quality. TC is heralded for their high quality delays and reverbs and this pedal follows in that legacy. Wonderful pedal to add to your board. Whether you choose to use all of its cool technology or not, you will be happy with the performance of this pedal. The audio tap feature is quite nice. 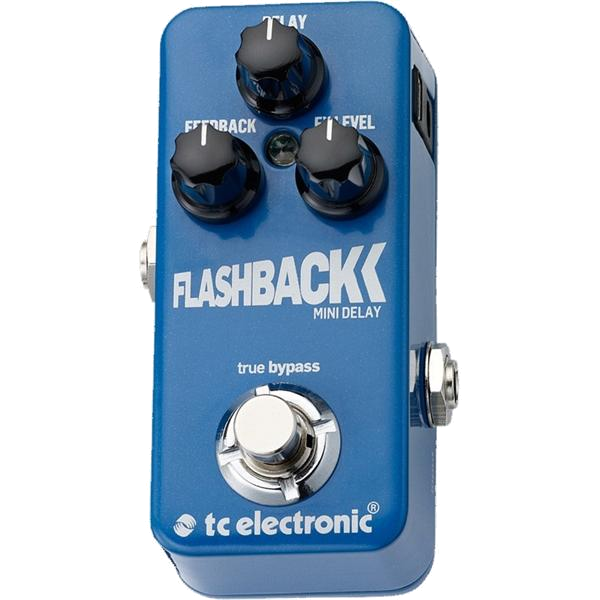 Sean, Saxophone - "I have been using the TC Flashback Mini now in live settings for six months after also trying the regular size TC Flashback, the Flashback 2, and the EHX Canyon. It is simple, small, and cheap. I have it set up as a glorified doubler most of the time, with the option to become a slapback. The pedals I use it with in my setup are the TC Sub n Up, Boss BF-2, and the EHX Canyon. It has great quality sound reproduction, especially in 2290 mode. I do wish it was easier to set the tempo on the pedal while playing. This pedal is perfect if you just want a simple delay. Set it to the 2290 Toneprint and go, or set up your own (Toneprints can be mindboggling on some pedals but it's straightforward for a delay). That said, get one used: for the new price I think you should just spend a little extra for a normal-size delay.